Springfield, Mass. -- Mike Vaughan walked out of the locker room doused in water and drenched in sweat. Mansfield had finally reached the mountain top. 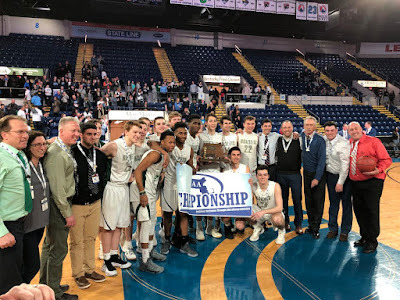 Sam Hyland scored 17 points and dished out five assists as Mansfield claimed its first state championship in program history with a 67-54 win over Franklin at the Mass Mutual Center. The Hornets made a state final appearance in 2013 only to lose to Putman, won the South in 2011, and reached the sectional final in 2015 and 2017 but on Saturday night they captured that elusive banner. The tournament run for Mansfield was nothing short of sensational. The Hornets never found themselves in a one possession game in the fourth quarter against any opponent despite facing perennial contenders in Needham, Newton North, BC High, and Franklin. Damani Scott finished with 19 points and five rebounds while Johnny McCoy scored 18 points to complement Hyland on the Hornets’ offensive attack. Hyland, a two-sport varsity athlete, said it was emotional just pondering the thought of being a state champion. Mansfield held a 10-point lead, 44-34, heading into the final eight minutes but quickly created separation. Hyland drove through the lane and dumped it off to Mccoy for two before penetrating and kicking to Justin Vine for a trey that gave the Hornets a 15-point lead. Mansfield’s lead got up to as many as 18 on a Ryan Otto jumper, but the Panthers made one last effort going on an 11-0 run highlighted by triples from Chris Edgehill (18 points) and Paul Mahon (14 points) to trim the deficit to 59-52 with three minutes left. Franklin had a pair of opportunities to cut it down to five but both of Edgehill’s runners missed. Back the other way Otto drilled a 15-footer off the dribble and McCoy went six-of-six at the foul line to seal the win for Mansfield. Franklin came out blistering from the field as a pair of deep Mahon treys put Franklin on top 16-9. Scott brought Mansfield back even before the end of the period finishing an and-one before coming through with a steal and slam to tie the score at 16 after one. The Panthers opened up a 25-21 lead early in the second quarter on two Edgehill free throws, but behind Hyland the Hornets closed the half strong. Hyland splashed two three-pointers to put Mansfield up 27-25. Moments later, Hyland showcased his talents going to the hole finishing consecutive three-point plays to put a bow on a 14-1 Hornets run that gave them a 35-26 lead going into the locker room.